DANDENONG’S Afghan Bazaar makeover has been applauded as an example for future council projects across Victoria and beyond. The City of Greater Dandenong project team responsible for the cultural precinct’s new look took home an LGPro Award for Excellence in Local Government on 19 February. They won the Community Assets and Infrastructure $1.5 million and under category. Community members and traders asked the council to upgrade the Thomas Street space in 2011. LGPro said the Afghan Bazaar Streetscape Enhancement Project team valued and harnessed community knowledge through consultation with more than 1400 people from the various ethnic groups within the Afghan community. 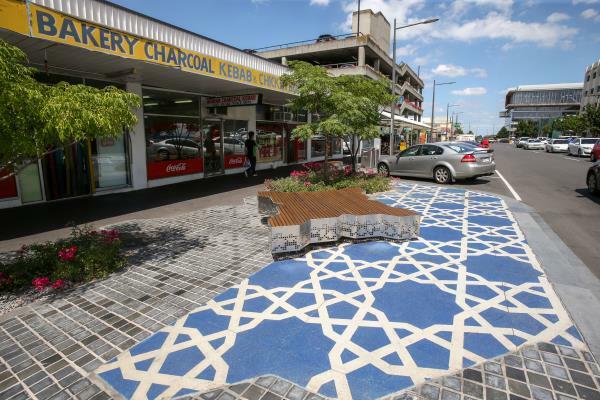 “The streetscape design has been a collaborative effort between traders, community leaders and precinct stakeholders and the end result is a vibrant precinct which celebrates the Afghan people,” LGPro said. “The Afghan Bazaar project is transferable to other organisations as an innovative consultation methodology and community driven design development approach. The project’s aim was to improve the area’s cultural identity and make the precinct more user-friendly and social. Blue highlights throughout paving and timber outdoor seating bring a touch of Afghanistan to the street, and artwork The Lamp now sits on the corner of Thomas and Walker streets as a distinctive marker. The makeover also included improved lighting, removing overhead power lines and expanded footpaths. Greater Dandenong mayor Sean O’Reilly said the Afghan Bazaar boasted almost 20 unique Afghan retailers including bakeries, carpet shops, grocers, fashion retailers, restaurants and kebab houses. “The precinct is a significant employer of local Afghani people and, importantly, has become a social space where community members can meet, exchange news and support each another,” he said. The council and the Office of Multicultural Affairs and Citizenship jointly funded the project’s $1.2 million first stage, started in 2013 and completed last year. The council will complete stage two works this year.